After a fantastic 2015, we’re looking forward to an even better 2016. Our first event of the year will be this Friday, April 1st and no, we are not fooling. We are offering more than 65 free and 99 cent books by forty plus talented authors. 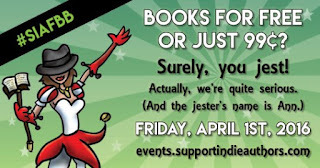 This year, you can find the books at events.supportindieauthors.com so mark your calendars and save the pranks for later! Hi Everyone! Today I'm handing the blog off to Ann, the Supreme Overlord of Support Indie Authors. As this post is aimed at authors, I expect many of you might ignore it, which is fine, but perhaps if you do read it, you'll see why this group means so much to me. I'm really not the only person out there who likes to keep things positive. 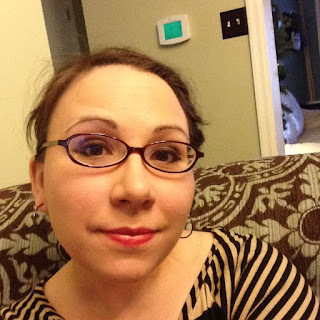 For those of you wondering who on earth I am and are raising your eyebrows at the Supreme Overlord reference, my name is Ann Livi Andrews and I run Support for Indie Authors, SIA for short (no relation to the Australian singer). What started as a small idea in January 2015 has quickly turned into a vast wealth of support, encouragement, resources, etc for Indie Authors. Wow! It's already March! Which means it's time for a new Go Bananas event! Congrats to all of February's winners! This month, we're kicking everything off with a bang in celebration of the final book in the Rise of the Discordant series being launched. As such, let's get right into it! Today, March the first, Past Life Strife, the first book in the series, is free on Amazon. Books 2&3, Splitsville and You Wish, are each 99¢ in the US and UK Amazon markets. These discounts will run all week. Once again, there will be a free book every week. 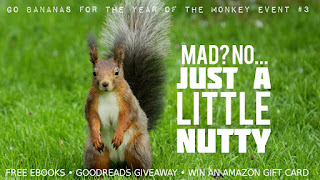 This time, check my author page every Tuesday to see what's up for grabs. I've also got a chance to win a paperback copy of Past Life Strife on Goodreads! Goodreads Book Giveaway Past Life Strife (Rise of the Discordant) by Christina McMullen Giveaway ends April 01, 2016.